Do you need help setting up your new home network? Are you having problems configuring your modem or router? Do you need wiring installed? WEBCO can help! 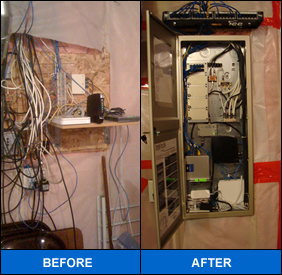 Structured wiring is the solution for the today’s electronics and technology advancements. There is a lot to consider when building, or remodeling a home or business. WEBCO takes pride ensuring that we have the solutions for your needs. Ensuring that you have the appropriate cables in place when you build provides the capacity, and flexibility for the future needs of your home or business. The benefits are endless, while increasing value to your real estate. Structured wiring is a method of providing communication infrastructure that is organized, and centralized. (Commonly in the mechanical room) A structured wiring enclosure also ensures a seamless installation for your TV and Phone utilities. Another common purpose for your structured cabinet is to provide a location for your network equipment. (Modem, router, etc) This eliminates having the required equipment on your desk, or counter for space saving. It is also common to have LAN (local area network) locations throughout the home for secure networking and Internet speeds. Using a LAN connection nearly doubles your speed online at a blazing 100 Megabits per second vs. 54 Megabits per second which wireless offers assuming you have optimum signal strength. With WEBCO you have an advantage of working with the elite, and experienced staff. Our team has the proven ability to forecast future technology trends saving you money in the long and short term.